Over on his blog rtlsdr4everyone, Akos has posted two new reviews. One post reviews the latest ham-it-up v.13 upconverter and the other reviews the “Balun 1:9” impedance transformer. An upconverter allows you to receive HF frequencies (0-30 MHz) with an RTL-SDR which has a lower frequency limit of 24 MHz. The ham-it-up upconverter was one of the first upconverters to go on the market that targeted users of the popular RTL-SDR dongle. Over the years the ham-it-up has slowly been revised and now it is up at version 1.3. The biggest changes in the latest version are a revised design that uses the ADE-1 in reverse (better VLF operation), a presoldered oscillator and it also now includes the previously optional noise source by default. In his review Akos compares the ham-it-up v1.3 to the older v1.2 model. His results show that the revised design seems to have better immunity to noise and better FM broadcast filtering. He also tests out the new battery power via connection and shows that using battery power is less noisy. Previously we posted a review comparing the ham-it-up v1.0, SpyVerter and Nobu’s Japanese upconverter. Although the ham-it-up v1.3 is much improved and we have not tested it, we still believe the SpyVerter is the better upconverter choice at the moment due to its better architectural design and included metal case, though Akos does point out that the ham-it-up is currently about $15 USD cheaper and has a passthrough switch. In his second post Akos reviews the Balun 1:9 which is a $10 balun that is designed for attaching a long wire antenna to the ham-it-up. The goal of the balun 1:9 is to transform the high impedance long wire antenna down to around 50/75 Ohms for the receiver. In Akos’ results he writes that he mostly see’s identical or better performance with the balun connected. To add to Akos’ review, we want to note that we think that there might be some confusion over baluns and ununs. We wonder if a 9:1 unun (instead of a balun) should be used for a long wire antenna, since a long wire is an unbalanced antenna. We think a balun should be used for a balanced antenna such as a dipole. In his review Akos also found that connecting two longwire antennas to the spring terminals improved reception. This may have possibly been because adding two longwires essentially created a balanced dipole antenna. To implement a longwire antenna unun with a balun, we think that the second terminal and coax shield should be connected to a good ground source like a cold water pipe. If you have knowledge on this topic please comment to confirm or expand on our theory. 2. EARTH ! Everyone forgets and wonder why they get SNR. 3, Power the Ham It Up from a pure DC (Battery if you can) not a Switch Mode power supply. Place ferrite cores on cable. Myne has USB “B” as power socket so I sacrifced an old A-B lead to a DC Transformer and regulated supply. I just received one of these yesterday, but had discovered the unun versus balun discussion after I’d ordered it. After examining the unit and the schematic what I did was cut the small trace to ground on the bottom of the unit and solder a wire onto the ground using the large plated through hole. That wire I then connected to the ground wire that I connected to one of the two antenna connections. The long wire was connected to the other. I definitely have much better reception than I did without the unit. This does not connect directly to the ham it up on it’s own. Please explain what is needed for this to connect directly into the Ham it up. And please, write guides that a novice can follow. What does not connect directly? The balun? You’ll need a SMA male to SMA male adapter to connect the two. Sorry for the delay in my comment but thank you Akos for the review of the upgraded version of the Nooelec upconverter, just ordered one. Had the original version a few years back and am anxiously awaiting arrival of the Version 1.3. I also bought a 9:1 NooElec Balun One Nine. The thing I did not understand is that this is a “BALUN” Balanced wires to Unbalanced CoAx” . Ie fine for a HF 2 wire Dipole but I really wanted a UNUN 9:1 “Unbalanced single WIRE to UN-balanced coax. I did not check out the wiring schematic on NooElec website before I bought it. It’s really well made and worth every penny but it does not come with any markings only to two push connectors for the two Dipole wires. It would be great if NooElec could give a wiring diagram for alternate UnUn single wire configuration or sell a separate model that can be used for long wire antennas. Just ordered one and now I’m confused too! The schematic indicates that it’s indeed a balun and not an unun, so in a 9:1 configuration it would be really low Z on the output for a dipole and half of what it needs to be in long wire config….so it would be neither apt for dipoles nor for long wires. Huh? So why don’t you make the two pictures the right way up each, are people that stupid? How you try to sell crap as new thing. Right way up, for literate people, will mean when they can read text on the board. And I’m not selling neither one, Nooelec does. What you have mentioned about Baluns and Ununs is right. The balun is meant to be used for a dipole or other balanced antenna. For a long wire end fed antenna you need a unun. The schematic on nooelec site says balun onenine is for dipoles (balanced)! I do not think it can be used for long wire antennas. Quoting Nooelec website: “An excellent way to attach a long wire antenna to the Ham It Up”. The fact that it actually improved my reception is a testament to the fact that it works. To close the unun / balun argument I did a test with a 9:1 unun, and the results are almost identical – identical to the point that SO listening to the same AM broadcast station could not say which one was better, the balun one Nine or a 9:1 unun. Update with unun testing also published on the blog. You used the same image exactly for the longwire and diople test. Did the longwire actually perform better using the balun than on the unun? At the same time how is reception on the dipole WITHOUT the balun? Since your dipole is not made of 450 ohm transmission line it probably does not need any balun. You also need to connect balun and unun ground to a proper ground for a longwire or the longwire is certainly not working properly without ground so the result is random and poor. 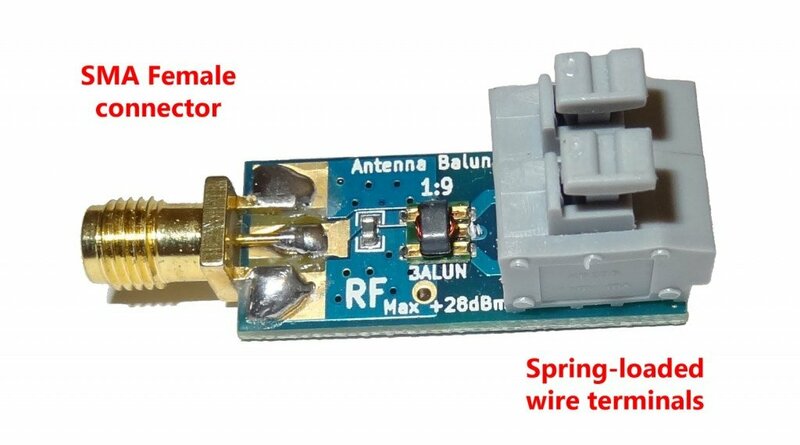 The unknown question now is if it is fine to use a balun for unbalanced wire antennas IF you connect one terminal to ground. Thanks longwire! My mistake, copied the wrong layer is PS. Cheers for pointing that out. I’ll do further testing with the modifications you suggested, just to see if there’s any improvement and make a youtube video when I got the time. Updated the post with a 9:1 Unun comparison – by ear, there’s little to no difference. Thanks, was a typo, edited that now. Speaking of typos, “Review” is misspelled in the title. I had the same experience with the Balun 1:9, when I hooked up a single longwire antenna (one leg of a doublet antenna) it was no better with the balun but when I added the second leg (full doublet) it really shined compared to a direct connection. Was your doublet set up as an actual dipole when you connected the second leg? I think this balun might actually designed to be used with 450 Ohm ladder line dipole antennas. The wiring diagrams for 9:1 ununs seem to be quite different to the schematic of this one. But then again for doublets usually a 4:1 is recommended (http://www.balundesigns.com/blog/baluns-for-multiband-loops-and-doublets-fed-with-open-wire-or-ladder-line/) so really i’m not sure. such an antenna, like the ladder feeded dipole and the longwire presents an high impedance and to use it with a 50 Ohm coax you’ll need a 9:1 balun; as a note the beverage is a directional antenna, so proper orientation may help picking up weak signals coming from its main lobe direction.